This volume explores label-free biosensors, advantageous in part because this technology bypasses the need of labels, reporters, and cell engineering, all of which are common to labeled techniques but may introduce artifacts in assay results. 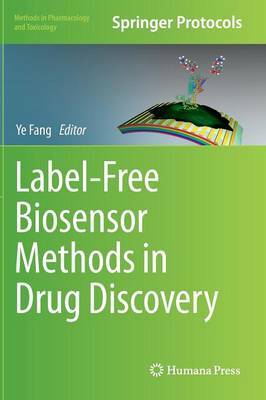 Addressing several fundamental and practical aspects as to how to implement label-free methods in the drug discovery process, this book covers a wide range of topics, including binding kinetics determination, fragment screening, antibody epitope mapping, protein-protein interaction profiling and screening, receptor pathway deconvolution, drug pharmacology profiling and screening, target identification, drug toxicity assessment, and physical phenotype profiling and diagnostics based on various cellular processes such as cell adhesion, migration, invasion, infection, and inflammation. As part of the Methods in Pharmacology and Toxicology series, chapters aim to provide key detail and implementation advice to aid with progress in the lab. Practical and thorough, Label-Free Biosensor Methods in Drug Discovery provides a new avenue for rapid access to a focused collection of highly regarded contributions in the field.